An undentified armed group has launched a deadly attack against a military camp in Abidjan which killed seven soldiers and seriously injured another dozen troops. Reports say a military camp of the Forces Republicaines de Cote d’Ivoire (FRCI) was attacked in the neighborhood of Akouedo around 3:30 a.m. The group reportedly took arms and ammunition from the armory before leaving the camp. Today, the United Nations envoy in Cote d’Ivoire expressed condemnation of today’s attack against a military base in Abidjan, Cote D’ivoire. In addition, the Secretary-General’s Special Representative and head of UNOCI, Bert Koenders, also strongly condemned the attack. Reports say, UNOCI has recently sent peacekeepers to help reinforces the FRCI in its efforts to secure the camp and its surrounding areas. 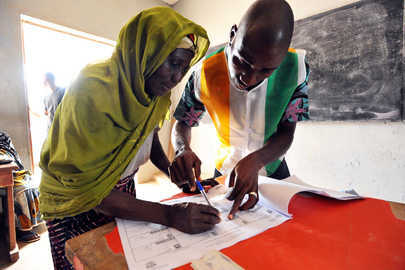 In addition, other attacks targeted a police station and a checkpoint in the aftermath of the post-election violence that followed the 2010 presidential polls. UNOCI is assisting the West African nation with the restoration of law and order, national reconciliation, the holding of legislative elections, and economic recovery. Last month, a mob of about 300 people attacked a U.N.-guarded refugee camp in Ivory Coast near the town of Duekoue in the country’s west, killing at least seven of the refugees, and 67 others were injured. Reports say the mob looted the shelters before burning them down. The Nahibly camp used to house some 4,500 people. The relocation camp for internally displaced persons (IDPs) completely burned to the ground, and its 4,500 inhabitants fled. The attack was targeted at members of the Guere community, which is being blamed by the Dioula community for an armed robbery last week. The Office for the High Commissioner for Human Rights (OHCHR) expressed condemnation of the attack and said the ethnically-motivated incident underscores the need to combat impunity for past abuses. A UN investigation team, including human rights officers, is being dispatched to the area today for a 10-day mission, according to OHCHR. In May 2011, Cote d’Ivoire’s inaugurated President Alassane Ouattara in the country’s political capital, Yamoussoukro. Cote d’Ivoire’s political crisis ended when former president Laurent Gbagbo finally surrendered in mid-April 2011, ending months of violence that erupted in the wake of his refusal to step down after he lost the United Nations-certified presidential run-off election in November last year, to Mr. Ouattara. The US says that after Mr. Gbagbo surrendered in April, and Mr. Ouattara was sworn in, much of the violence ceased. Earlier this June, the United Nations refugee agency said as the situation stabilizes in Cote d’Ivoire, the pace of the Ivorian outflow into neighboring countries is gradually slowing. According to the refugee agency, in the past week for example, the average number of Ivorians crossing into Liberia has gone down from 200 to 130. The refugee agency also has resumed the repatriation of Liberian refugees who had been stranded in Abidjan, Cote d’Ivoire, during the recent post-election violence.